Reminders of that old Chinese curse – ‘may you live in interesting times’ – are filling the financial pages/blogs/chatosphere at the moment. The consensus is that a fall by the Chinese stock market of over 30% is a massive sneeze, and when China (with 15% of the world economy) sneezes, the rest of us are due for a cold. And yet, and yet, I don’t buy it. Seeing FTSE-100 below 6000 and my portfolio page full of red ink (did you know that in China red means price increases?) is quite a jolt after months of very little turbulence in the UK/US stock markets. Many better bloggers than me are adequately covering the key points – have a plan, stick to it, and if anything this correction is a buying opportunity. So while I may be cursing that August is my lowest month for dividends, and my tradeable cash reserves are empty, there is nothing to see here so why not move on? My plan, in fact, has a strict geographic asset allocation. China does not feature explicitly in it at all. In fact even ‘Asia’ is part of ‘International’ for me and is basically the remnants after my core exposures to the UK/USA/Australia. With Australia giving me some ‘Asia/Pac’ exposure I have very little direct exposure to Asia, and am very comfortable that exposure. I feel that China hardly affects my life, so I am not that bothered whether it doubles or halves, and am happy to forgo the excitement/returns that a more globally diversified stock portfolio might give me. 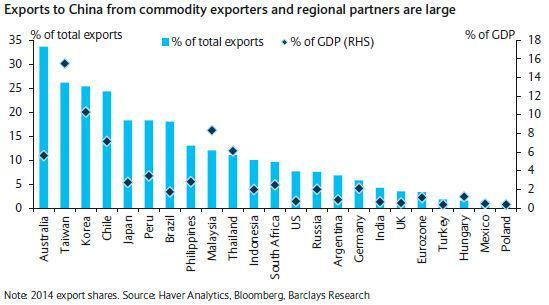 Moreover, when I look at my core investments, China is ‘underweight’ there too. UK exporters are underweight in China; we export about £12bn to China, somewhat less than Germany/France/Italy do. A key export sector for us is defence, which is not going to feature China as too prominent a customer. Big UK businesses generally do not rely on China as much as, say, big American ones do, or the German automotive companies do, or the Australian miners do. Even our own Foreign Office says “the extent of UK underperformance [exporting to China] is stark”. So, I realise I must sound like a cross between Monty Python and a parochial Little Englander, but I think the impact of disruption in the Chinese economy on my UK/USA portfolio is second order at best. Moreover, what is really happening in China? The stock market has tumbled. So what? This has practically no more bearing on the actual economy than the weather forecast – it might influence peoples’ moods but it doesn’t reflect GDP, consumption or productive investment. Maybe the tumble is indicative of wider concerns about the Chinese economy – maybe, horror of horrors, long-term growth in China has reduced a bit to mid single digits from high single digits. But what does this mean to a long term view of the value of the companies that I co-own? Nada. So when I ask myself ‘have my core holdings become less valuable’ due to any of the news emanating from China, I can only answer ‘No’ (with a few exceptions, of course, such as Prudential, HSBC and Aberdeen Asset Management). They are the same decent, strong, resilient companies they were a month ago. And they are over 10% cheaper. I wish I had more cash available to go bargain hunting. Totally agree with your closing sentiments. I wish I had more cash to put to work in these volatile times. I am seeing so many bargains out there right now. However, all is not lost. September tends to be one of the worst months on the stock market, China woes aside. So fingers crossed I can be frugal enough to save up that much bit more towards my almost-end-of-the-month purchases. > And they are over 10% cheaper. I wish I had more cash available to go bargain hunting.